Hi buddies, I’m going to talk about Symfony build, test and deploy on Google Cloud. With this way, we will able to get full automation each process. We’ll have less tolerance regarding any human mistake. In order to provide this, we’re supposed to install gcloud. You could follow this document, it’s piece of cake. After that, you should just run all of these commands. 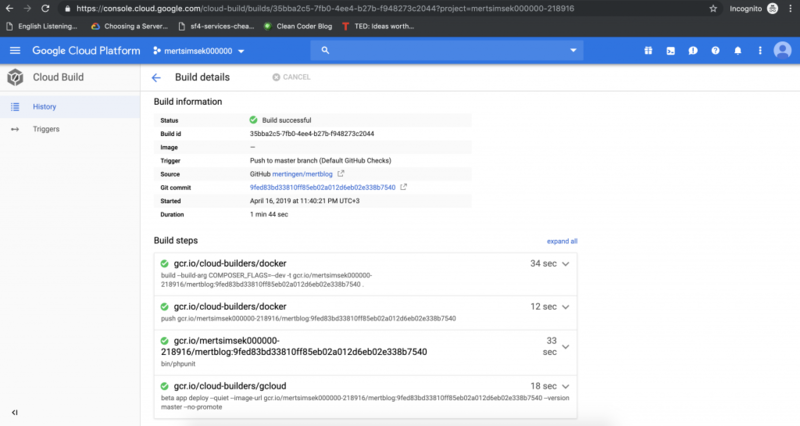 From now on, our gcloud sdk is authenticated to our Google Cloud Project. You can also follow Google’s documents, if you have any trouble. Well, let’s create a Symfony project with Composer. 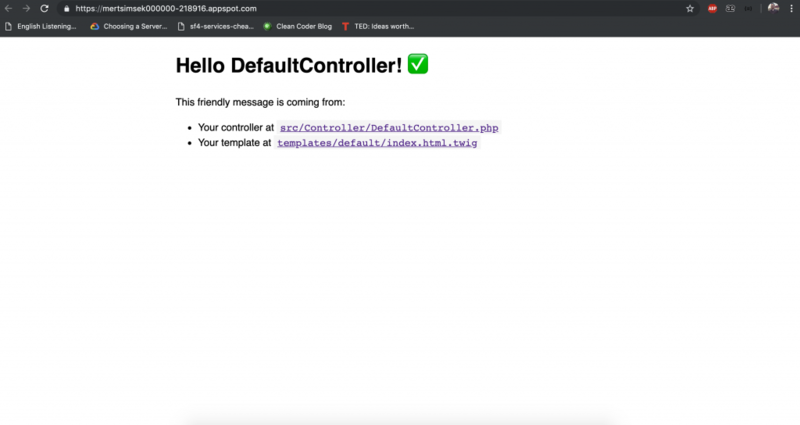 Run these commands to run a Symfony application. The content of the controller is as following. I changed only route. That’s it! We’ve all libraries and files which we will need further. In order to deploy into Google Cloud App Engine, I create the app.yaml in root directory of the project. Shortly after, I run this command to deploy. This command automatically reads this file and takes the actions. It may take a little long time. Whereas, everything is fine and going well, don’t worry about it. Once it’s finished, run this, you’re going to see our Default Controller response on App Engine production. Perfect! From now on, I am able to create a GitHub repository to automation and push Symfony application into this repository. As you see, my repository is ready. Right now, we have to integrate with GitHub and Google cloud Build. For this, you can go to this page. You’ll encounter this and click the Set up a plan button and go ahead. It will demand to a repository to run. I’ve selected my repository which I’ve created a moment ago. 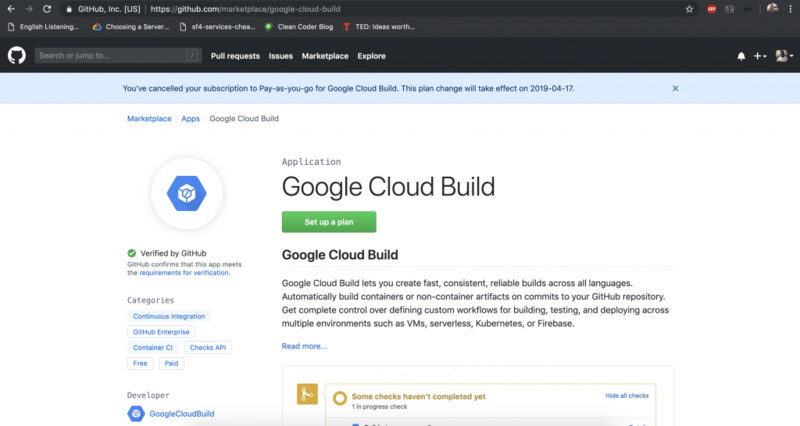 With this way, Google Cloud Build and GitHub will integrated run smoothly. Now, I create a Dockerfile and Docker ignore file to create a container in root directory of the project. I’ll use this container for testing my application. No more, we don’t get any manual process. To automate my processes, I create a cloudbuild.yaml file in root directory of the project. There are 3 sections in this file. 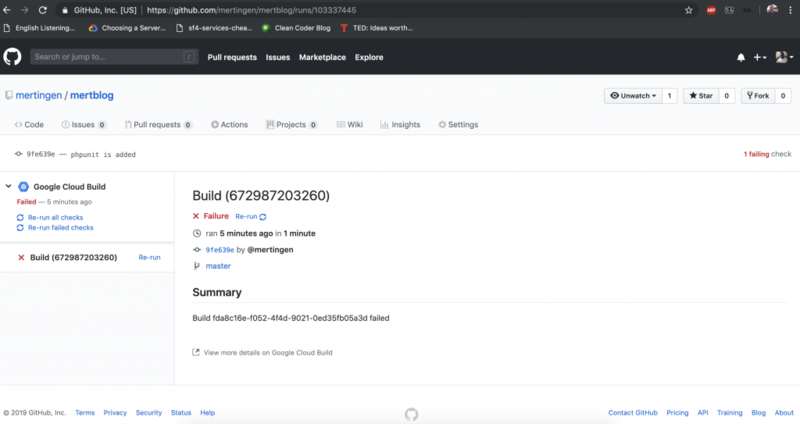 First of all, Google Cloud Build is building our application and testing according to our configuration. If these steps are succeed, it deploys to App Engine. But without deploying, we need to do somethings. For example, let’s create a test class. Nice! We check out the HTTP status code and the title of the page. We cannot pass this test because, our title is not Hello Mertblog. I won’t change, because I would like to see failed build. 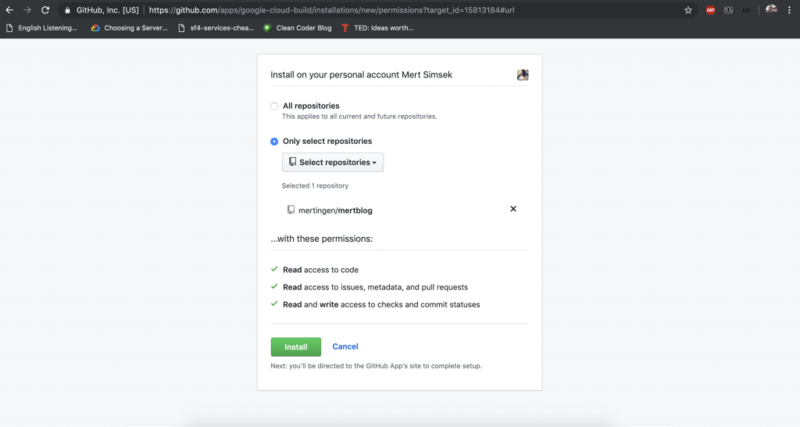 Well, we have to grant permissions to Google Cloud Build for App Engine. As you see, I’ve set these permissions to Google Cloud Build. In addition to this, you had better, not forget to add new files which we’ve just added on Git. 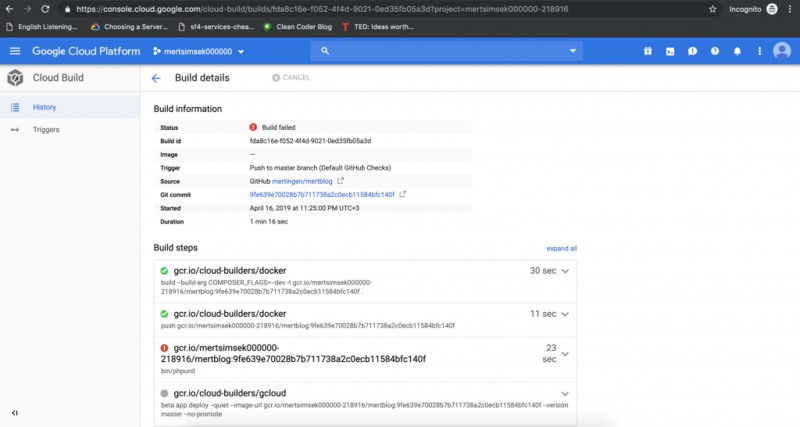 I’ve pushed to GitHub my new files and it will be automatically builded on Google Cloud. 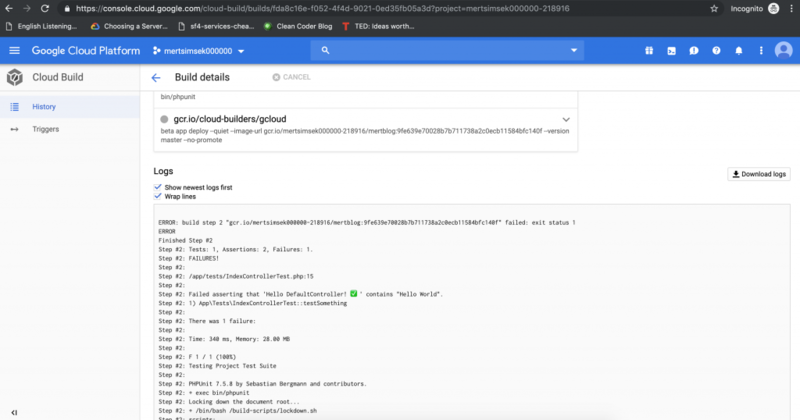 If you go to Google Cloud Build page, you’ll see it is failed because of our test. The HTTP response code is 200 but the title page is not as I demanded. It couldn’t pass. By the way, deploying didn’t run. Because, in order to deploy, other steps should succeed. We can look over the details. You can also check on GitHub. Let’s fix somethings such as our title on the page. 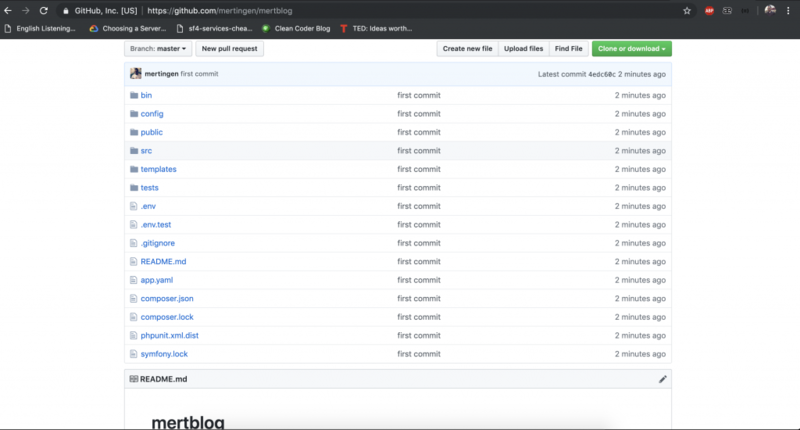 I changed the title as Hello Mertblog and I push my new codes GitHub. From now on, every step is perfect. In order they succeeded regarding cases. Now, As long as you go to App Engine you see 2 versions to run. And master version is our main version which is deploying from GitHub by Google Cloud Build. We have to change traffic, If we need to see changing on our repository. You can stop old version and click Split Traffic button on this page. And give 100% traffic. Like this. As you see, my last codes were deployed obviously, the title was changed. In addition to this, I am going to check on GitHub. I could see that there is no any errors or failures stuffs. Well done! If we gather, there is a big benefit and opportunity to use Google Cloud Build, Google Cloud App Engine and Symfony together. All processes are able to be automatic with this way and we can be away from mistakes. As long as if you have any trouble or problem, don’t hesitate to stay in touch.